"It's kinda hard not to have an epiphany when someone's pointing a gun at your head." Time travel paradox shenanigans like this are enough to make you want to tear your hair out. Going back in time and killing Hitler is a recurring theme in time travel stories. But is Julian a monster or a savior? Did he truly believe that he was freeing all those people in New Pemberton as well as millions of future victims from a horrible form of living slavery, or was he killing all of those unfortunate people to advance his political agenda? When Kiera realized that Julian was Theseus, she thought she had a chance to stop the massacre at New Pemberton before it happened by killing a teenager in cold blood. Carlos, pushed into the unenviable position of saving Julian from Kiera, argued that Julian wasn't Hitler-ish yet and the future could already have changed. 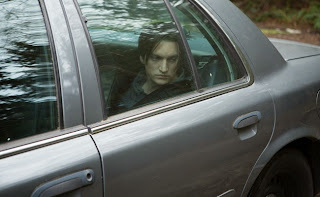 Paradoxically, it was suggested Julian was pushed into his path as Theseus because of Kiera's actions in this episode. Was he? When he was released from prison, the first thing Julian did was completely reject Liber8 and his followers. Kiera's actions made him change his mind. Or would he have changed his mind anyway? Alec's role in all this was fascinating. While Alec and Julian were hanging out, being all brotherly and visiting Mom in the hospital together, the episode concluded with a shot of the chip that the New Pemberton slaves were working on. It was labeled 'SadTech'. Kiera said that there was good in Alec, but not in Julian. How can she be so sure? Alec said at one point that he and Julian were chess pieces on someone else's board. That one stayed with me. Whose board is it? I've been assuming that it's the elder Alec, but is it? In other news, Mr. Escher at Piron is now privately funding the VPD's pursuit of Julian Randol and Liber8, and Nora, with bitter comments about slashing her own throat with the glass ceiling, has been replaced by Inspector Dillon. What is Dillon's agenda? For that matter, what is Escher's? -- The episode began and ended with flashforwards to New Pemberton in 2035, forty-two years before Kiera's time. -- Julian's writings have been published as 'Theseus Rises'. The e-book cover looked an awful lot like a poster of Hitler youth. Hit us in the face with it, why don't you? -- Ann took a bullet for Julian. When she and Alec were alone, I was certain Alec was going to ask her some questions about his father, but no. -- Lucas tried to convince Julian that Sonya was crazy, believing she came from the future. He followed that by talking to himself and saying it was Kagame. I knew Lucas was nuts, but is he that nuts? -- In this week's hair report, Julian's 2035 beard screamed that it was fake. A little distracting. Kiera: "This is why the legal system is automated in the future. No human frailty to corrupt the process." And she said this right after we saw how horrible it was in the future. Kiera: (reciting a nursery rhyme) "When darkness falls and fear sets in / He'll be the one the nightmares bring / With blackest soul and coldest core / He'll paint a T across your door." Kiera: "Every monster starts off as someone's baby." Alec: "I know what torture looks like." Alec: "Is that what they call it in the future?" Well, yes. And under the Bush administration. Julian: "So I guess I have you to thank for my life." Carlos: "Yeah. Don't think the irony is lost on me."